Ahhh summer. The time of endless fresh vegetables and farmers markets. 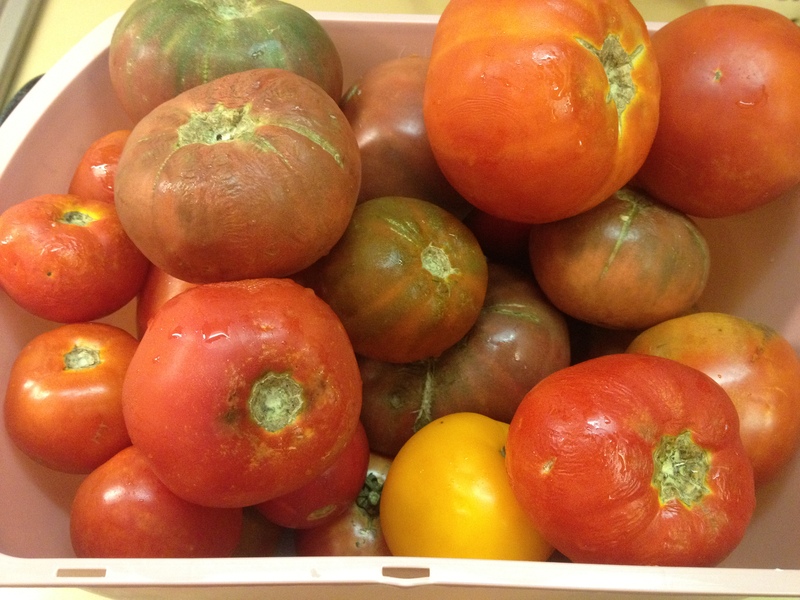 This is the perfect time to take advantage of fresh local delicious tomatoes! The Heirloom varieties are my favorite. Always jump at the chance to get some Cherokee Purples, Yellow Valencias, Brandy Wine, German Stripe, Ananas Noire, Early Girls, or Arkansas Travelers. As a special treat I will quickly tell you the recipe for a delicious Heirloom Tomato Pie that I make quite often in the summer. Being with a hearty wheat pie crust. To make an easy one yourself cut a 1/4 of a stick of cold smart balance butter (salted or unsalted and add 1/2 tsp salt) into 1 cup of whole wheat flour mixing in ice water until it clumps together–between 3-5 Tablespoons. Then grease a pie pan with a little olive oil and push the crust in to cover the bottom and sides. Would you like to be a pie? 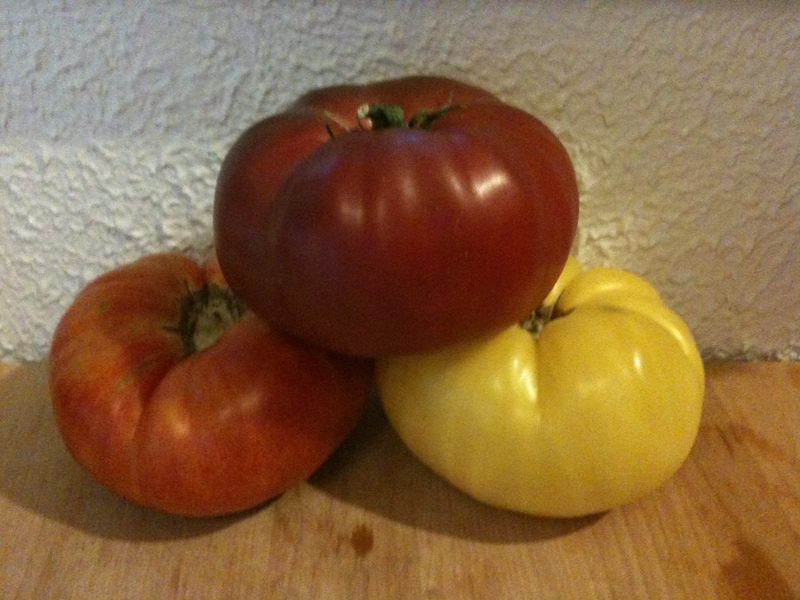 Cut 3-5 heirloom tomatoes (different colors/varieties) and try to get some of the juice out. You can do this by layering them on a colander and sprinkling with salt–letting the seeds and juice drain out for at least 10min. (Be sure to drink that juice!) 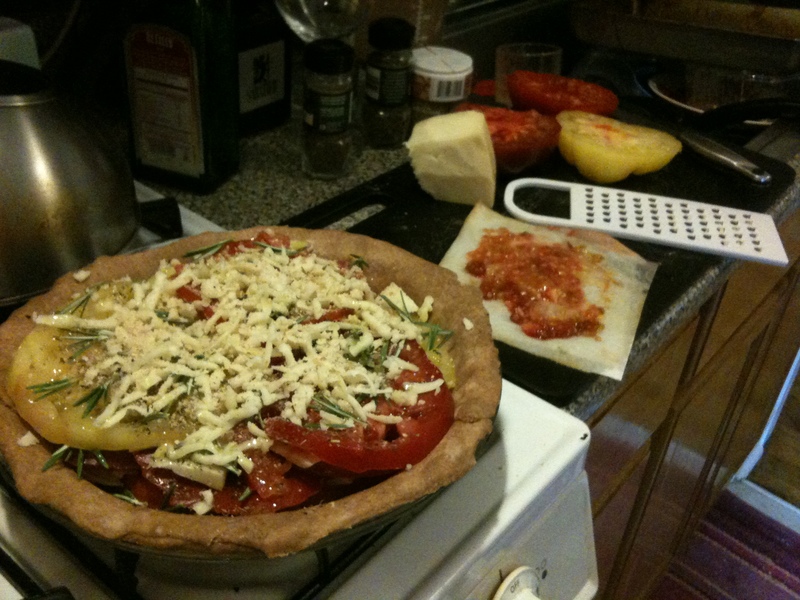 Next alternate layering tomato slices, Gruyere cheese and fresh herbs such as rosemary, thyme and basil into your pie crust. Salt and pepper to taste. Stack it up high and bake at 350˚ for about 1 hour. ENJOY! Begin with a bunch of tomatoes. You can can any amount–large or small–just keep in mind it takes about 6-7 medium sized tomatoes per quart (about 2 3/4 lbs). Perhaps mixing your favorite varieties or making jars with all the same kinds together. Choose the freshest tomatoes as possible and make sure there are no bad/rotting places on them. 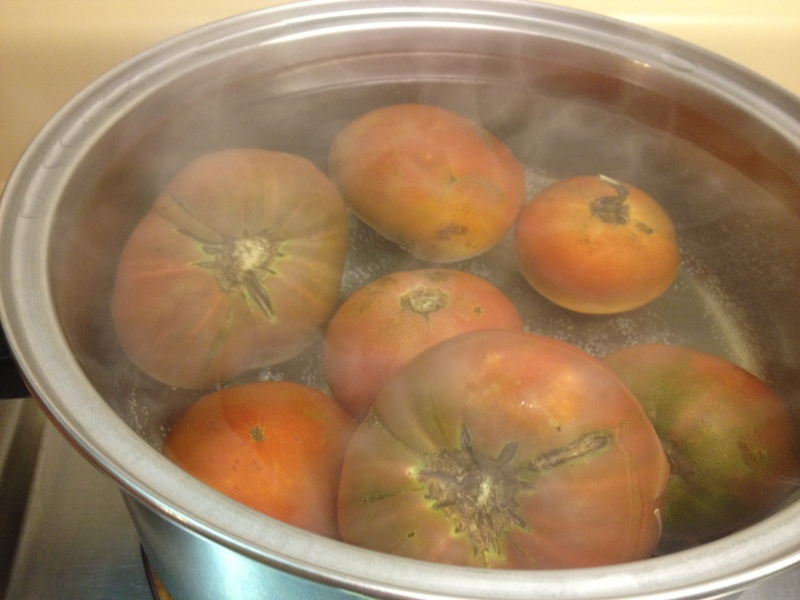 Boil a large pot of water–just a large pot, not your giant canning pot. Now, you are going to “dip” your tomatoes to make the skins easily slide right off! So, put 4-6 tomatoes in the boiling water and let them bob there for a minute or two. 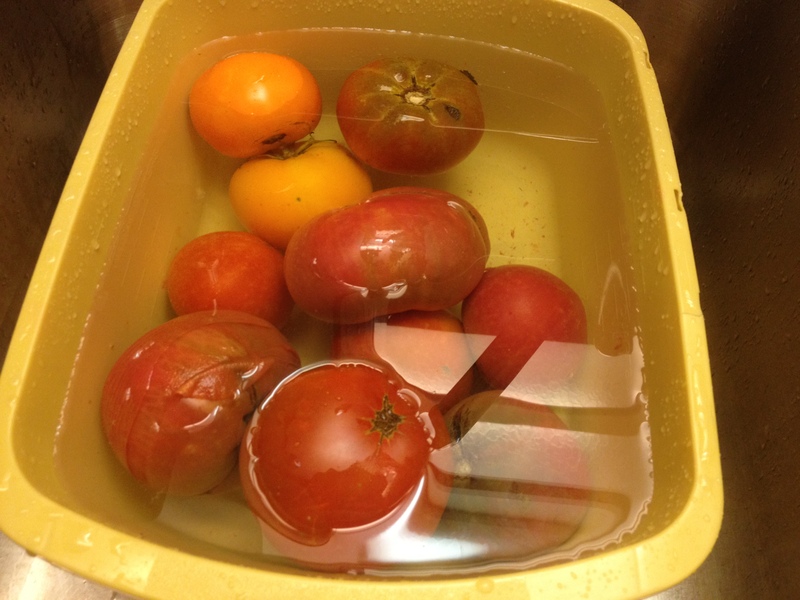 Then, dip them out and put them in a tub or sink of cold water (iced if needed). 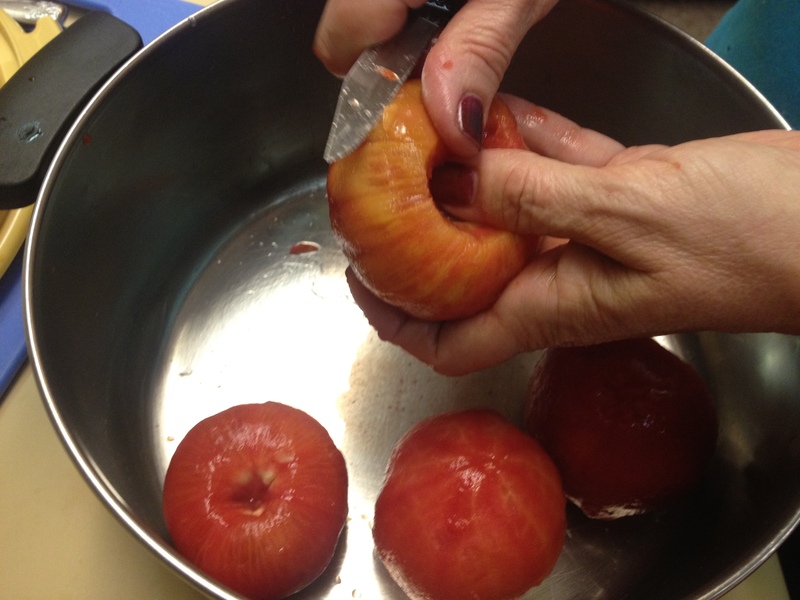 Next use a paring knife to peel the easily peel the skins from the tomatoes. Core them while you are at it, removing any green spots and set the tomatoes into a pot (getting ready to cook in a little while) and get the jars ready. 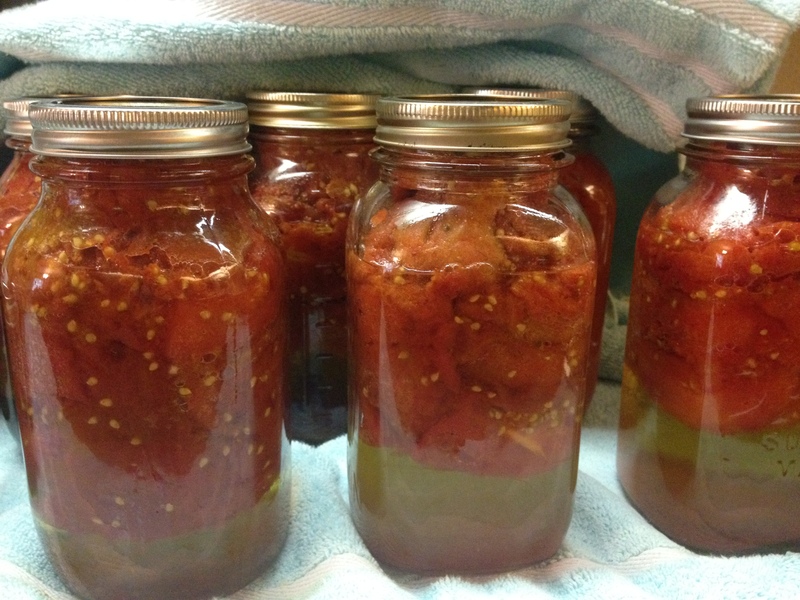 Depending on how many tomatoes you have, get several quart jars prepped. Wide mouth jars are the easiest if you are canning whole tomatoes but small mouth will work as well. 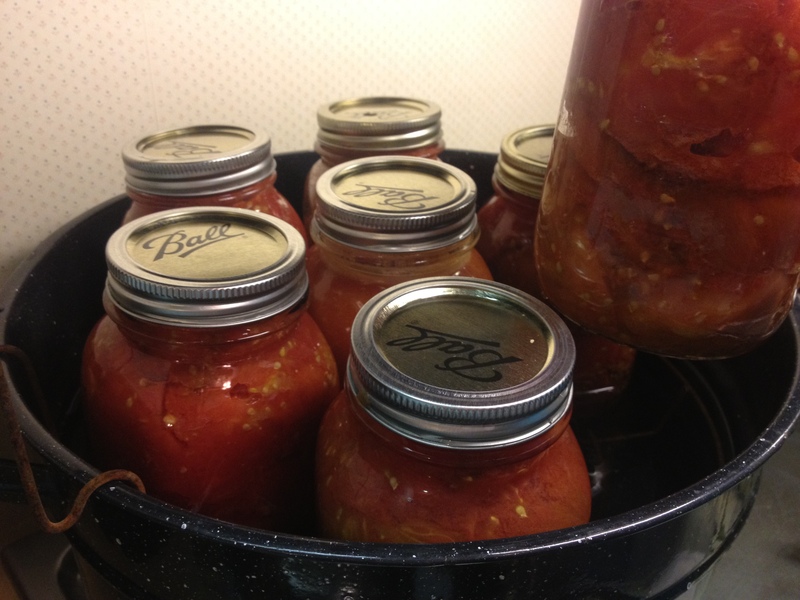 Fill your giant canning pot with water and begin heating it on the stove on high heat getting it boiling. Examine your jars, looking for crack or chips and discard any that aren’t perfect as they will not work. Wash the jars with hot, soapy water or run them through the dishwasher. Once the water is boiling, carefully set your jars in the rack and lower them into the pot for sterilizing. (The rack is great because it keeps the jars from touching, which at that high temperature, keeps them from touching and breaking). It’s time to be serious now! Make sure your hands stay clean and you are no longer handling the jars around the opening or on the inside. Fill a sauce pan with some water and heat to boiling on another burner. Then place canning lids (NEW) and rings (can be reused) in here for sanitizing. Use a clean damp dish cloth to wipe the tops of the jars. 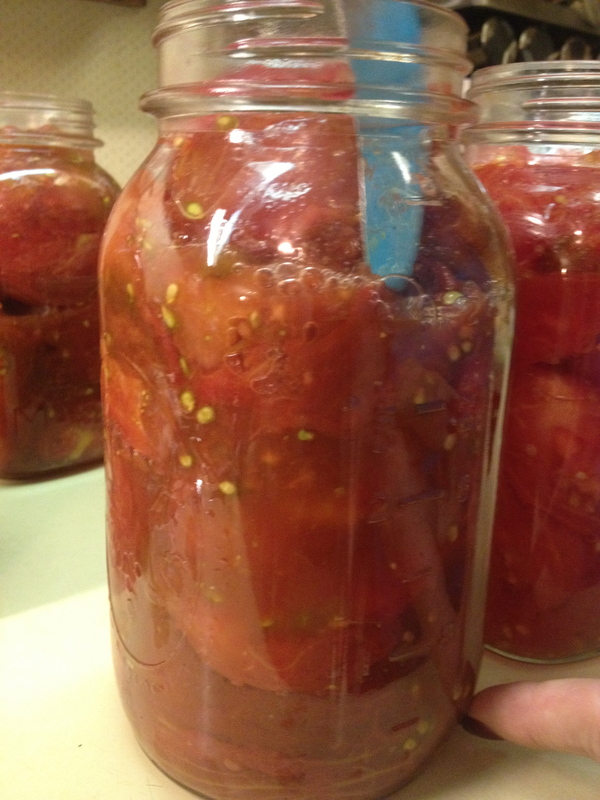 Use tongs to get out canning lids and place them rubber (sealing) side down on your jars. Then use the tongs to grab rings and screw them on! Now place your jars one at a time into the rack in the canning pot using the jar lifter and balancing them as you place them in. (For example don’t place them in clockwise, but rather 12:00 then 6:00, 3:00 then 9:00.) The water should be hot and not boiling and, after you lower the rack down, should cover the jar by 1-2 inches. (Add more water if necessary). Place the lid on and bring water to a boil. Then process (cook) quarts 45 minutes (Pints–35 minutes). Carefully remove one jar at a time and place on a thick bathroom towel. Once all jars are out, cover with another thick bathroom towel so that there are no drafts. Cool and leave in place for 12 hours. (Listen for the pop sound of the seal working! During this time do not tighten rings.) Remove the rings and clean the outside of the jars, checking for the seal. Add a label or write on the top to identify what you have made and the year you made it. Store in a cool, dark place like a pantry and enjoy over the next several years. 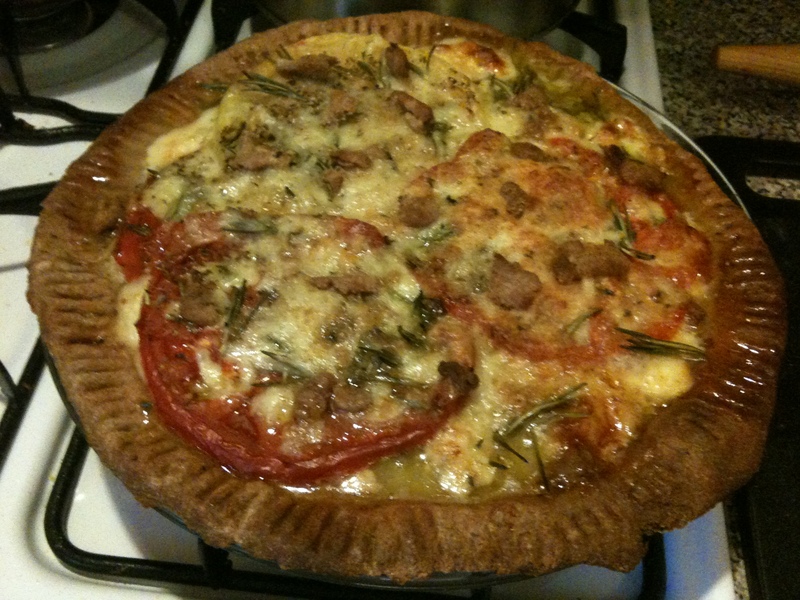 That pie looks awesome, and what a magnificent way to use up tomatoes. It’s my favorite! I highly recommend! Sometimes the tomatoes separate from the juice, but that is normal. As long as the seal is good then nothing inside will spoil, regardless of whether or not it is in the liquid. Keep up the good work and enjoy!